3 Problems were solved with oppression. 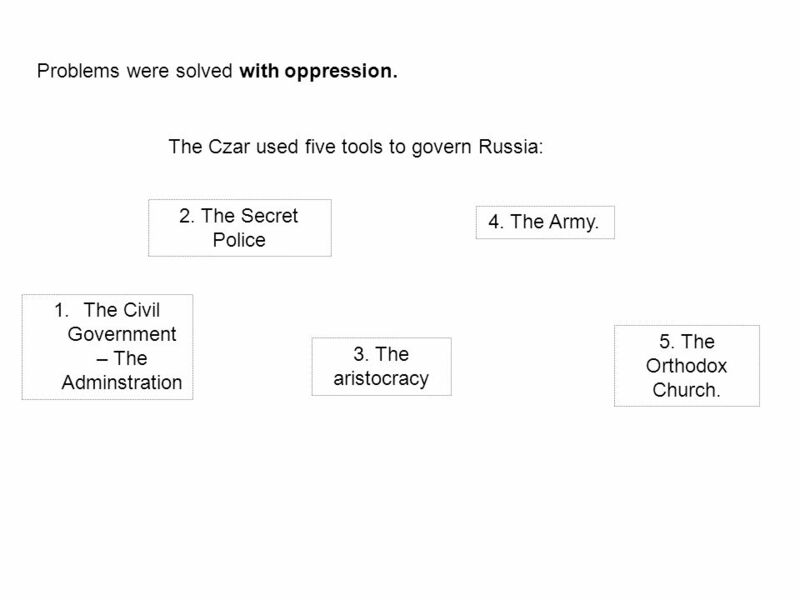 The Czar used five tools to govern Russia: 1.The Civil Government – The Adminstration 2. The Secret Police 3. The aristocracy 4. The Army. 5. The Orthodox Church. 5 How did you get a job in the Russian Administration? Your job was to help the Czar, you were a personal servant to him. You should please your superiors and the Czar. You were hired by your superiors and could be fired by him, no right to appeal. Never got fired since that meant that the superior made a mistake hiring you. No skills required, Loyalty and the ability to follow orders. Career? There were 14 grades, tjin. You start at the lowest 14th. Grade four and up = nobility. To get the good jobs you had to earn the higher grades. Problems caused by this : Higher civil servant had no contact with the people. 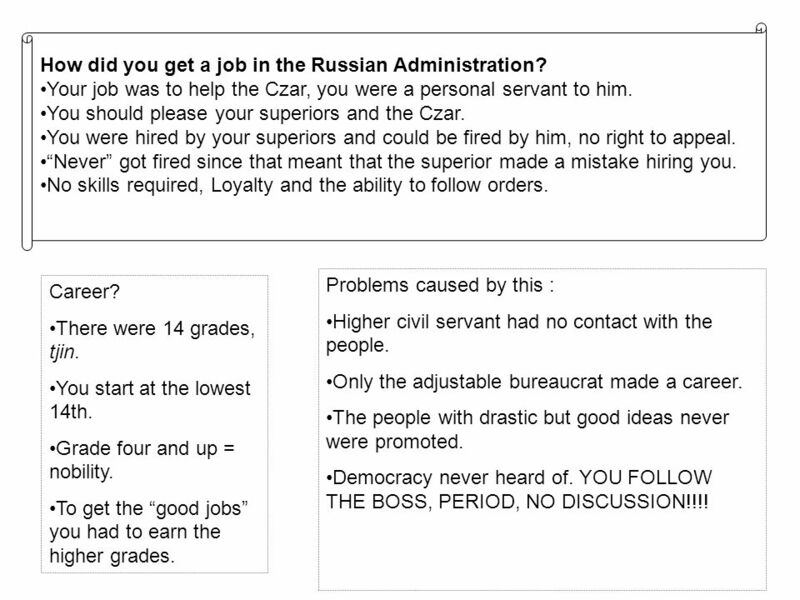 Only the adjustable bureaucrat made a career. The people with drastic but good ideas never were promoted. Democracy never heard of. YOU FOLLOW THE BOSS, PERIOD, NO DISCUSSION!!!! 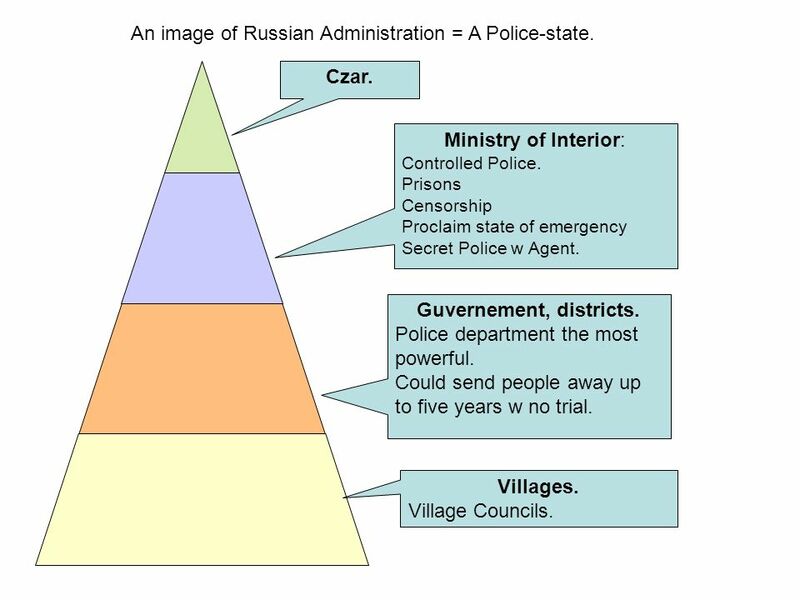 6 An image of Russian Administration = A Police-state. Czar. Ministry of Interior: Controlled Police. Prisons Censorship Proclaim state of emergency Secret Police w Agent. Guvernement, districts. Police department the most powerful. Could send people away up to five years w no trial. Villages. Village Councils. 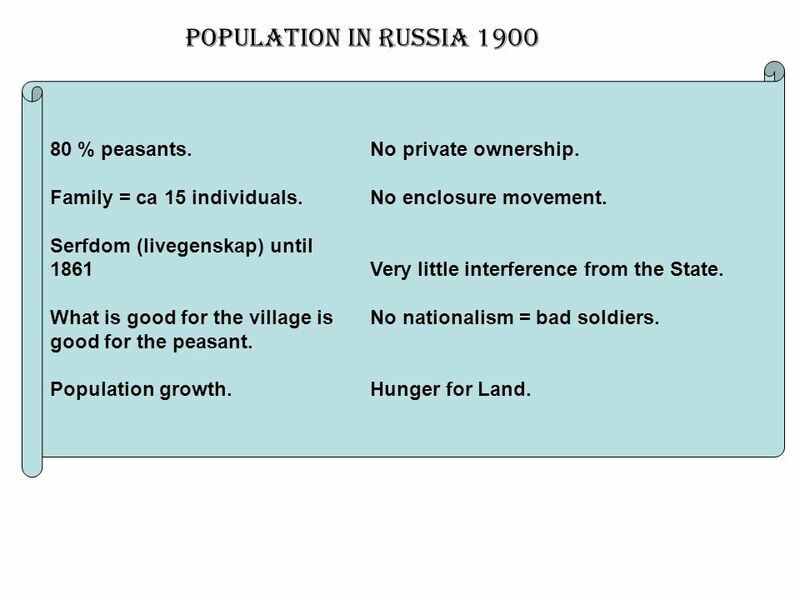 7 Population in Russia 1900 80 % peasants. No private ownership. Family = ca 15 individuals.No enclosure movement. Serfdom (livegenskap) until 1861Very little interference from the State. What is good for the village is No nationalism = bad soldiers. good for the peasant. Population growth.Hunger for Land. 9 Problems in the countryside: The Mir: What they decided went for the whole village. If they said that everybody should vote for Bolshevik – you voted for Bolshevik. Since the Starosta could be replaced he never disagreed with government. They decided on crops It only mattered what was good for the village. No feeling for the Nation = Bad soldiers. 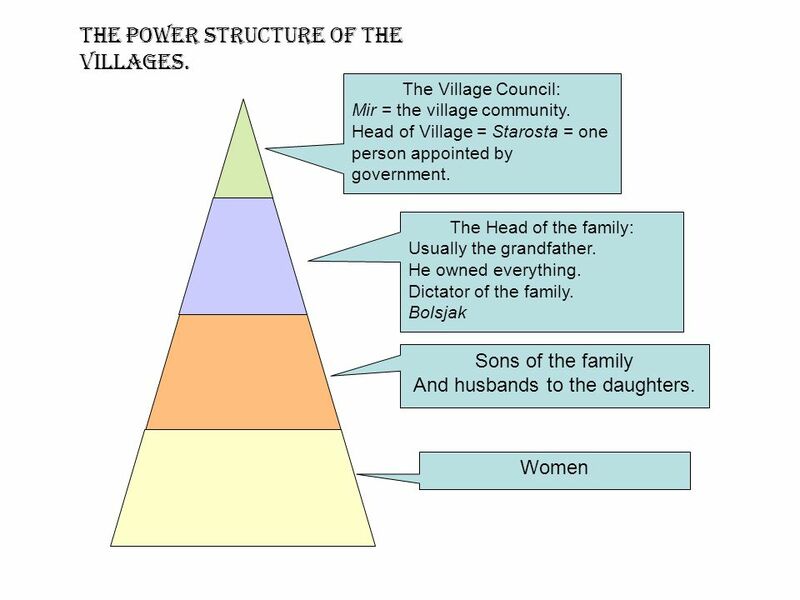 The Bolsjak-system: The young sons and husbands didnt own the land. No incitement to improve production. Growth = getting more land instead of improving methods. The individual had no idea which part of the land he would get. Didnt kick out the unproductive parts of farming society. No enclosure movement. 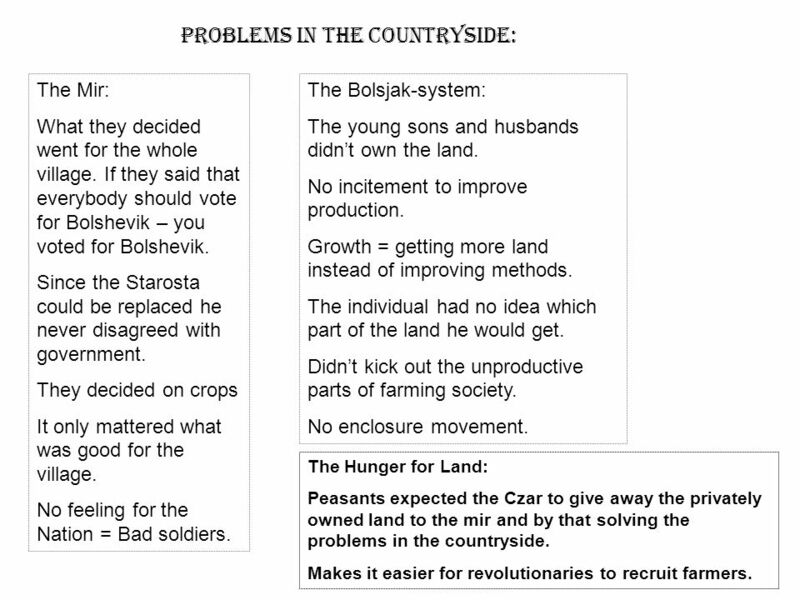 The Hunger for Land: Peasants expected the Czar to give away the privately owned land to the mir and by that solving the problems in the countryside. Makes it easier for revolutionaries to recruit farmers. 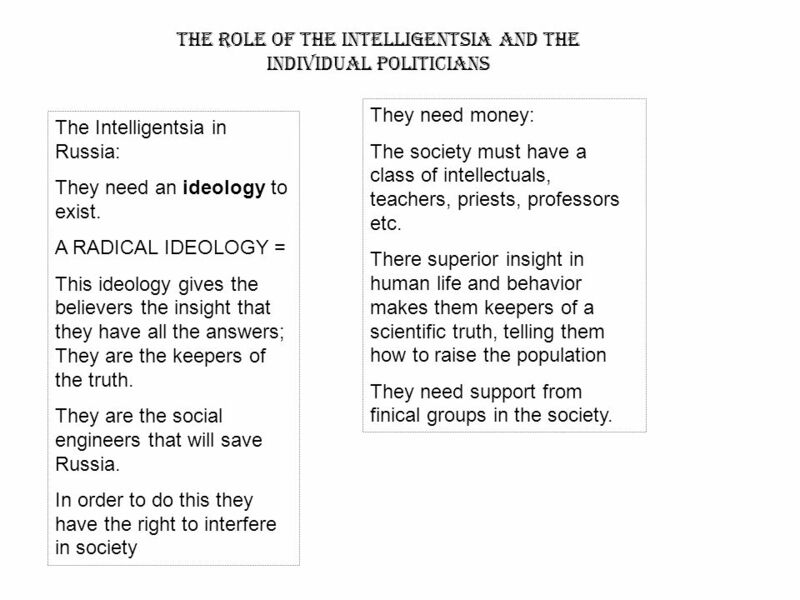 12 The Role of the intelligentsia and the individual Politicians The Intelligentsia in Russia: They need an ideology to exist. A RADICAL IDEOLOGY = This ideology gives the believers the insight that they have all the answers; They are the keepers of the truth. They are the social engineers that will save Russia. In order to do this they have the right to interfere in society They need money: The society must have a class of intellectuals, teachers, priests, professors etc. There superior insight in human life and behavior makes them keepers of a scientific truth, telling them how to raise the population They need support from finical groups in the society. 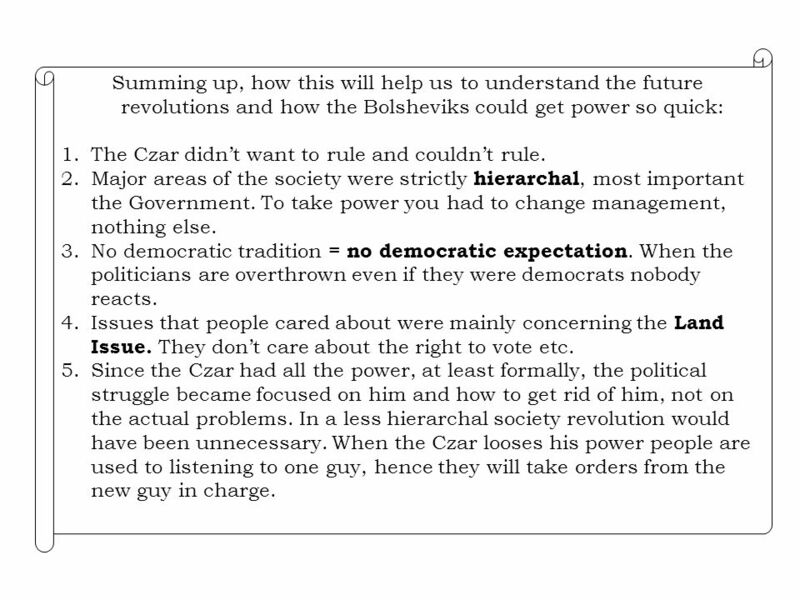 14 Summing up, how this will help us to understand the future revolutions and how the Bolsheviks could get power so quick: 1.The Czar didnt want to rule and couldnt rule. 2.Major areas of the society were strictly hierarchal, most important the Government. To take power you had to change management, nothing else. 3.No democratic tradition = no democratic expectation. When the politicians are overthrown even if they were democrats nobody reacts. 4.Issues that people cared about were mainly concerning the Land Issue. They dont care about the right to vote etc. 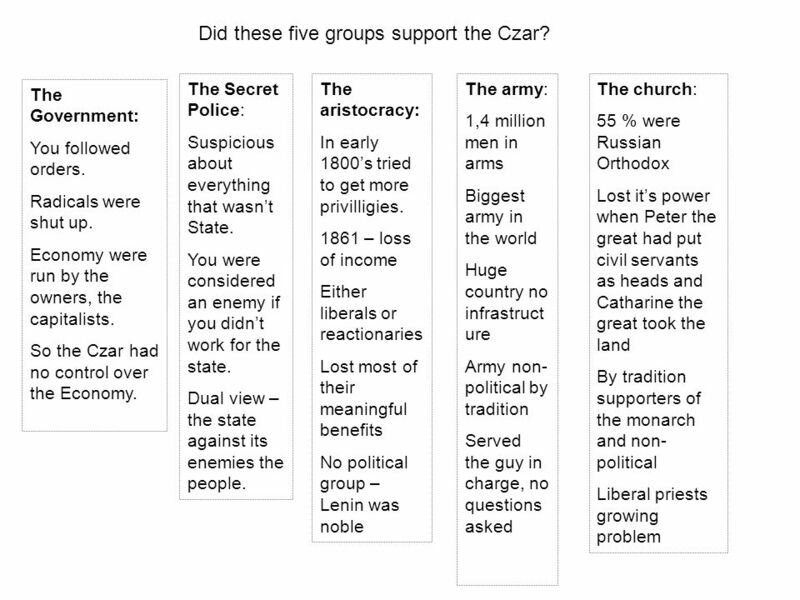 5.Since the Czar had all the power, at least formally, the political struggle became focused on him and how to get rid of him, not on the actual problems. In a less hierarchal society revolution would have been unnecessary. When the Czar looses his power people are used to listening to one guy, hence they will take orders from the new guy in charge. 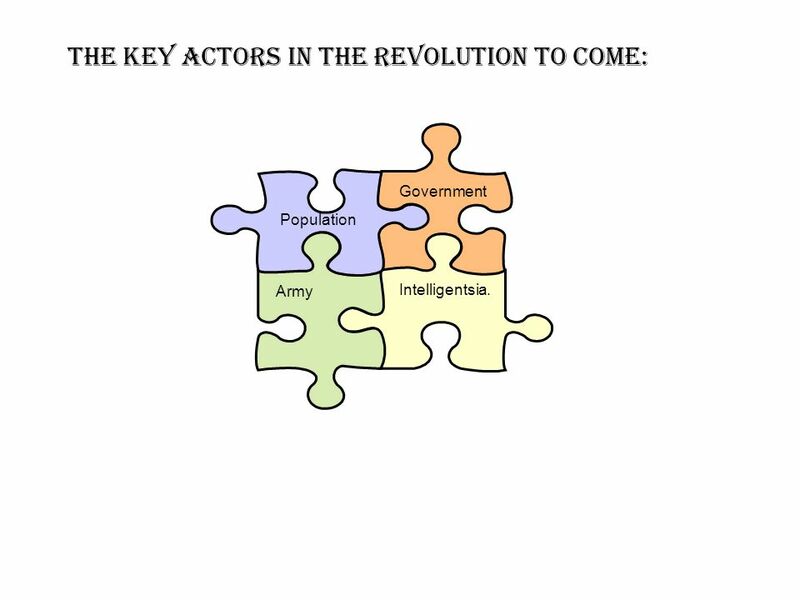 Download ppt "Government Intelligentsia. Army Population The Key Actors in THE REVOLUTION TO COME:"
Discontent and Opposition to the Tsar. The nature of Russian society in 1914 Russia is a vast country stretching from the Eastern European plain, across. Animal Farm is an allegory Allegory: A story in which the characters, places and events mean something else, often a real life event. Allegories make. 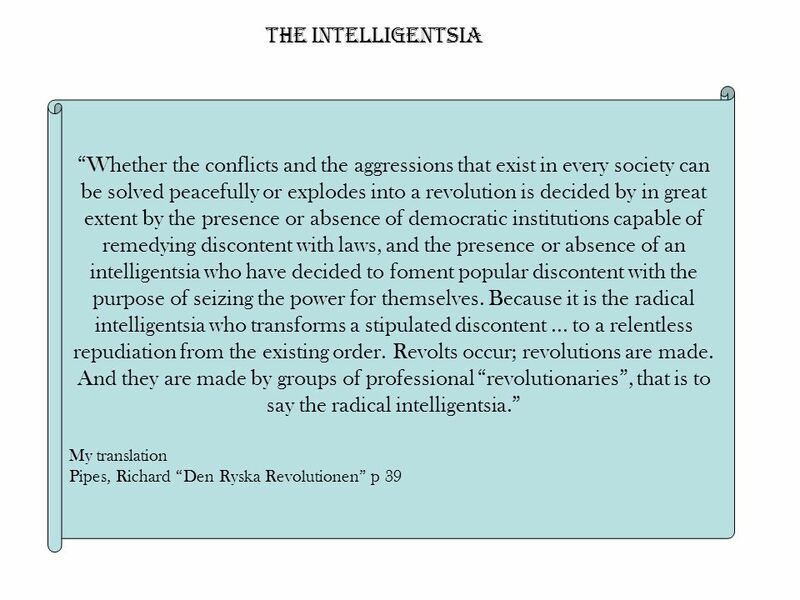 RADICALS AND THE REIGN OF TERROR. Divisions in the Legislative Assembly Despite having a new government many problems still existed. People were still. Russia in the late 19 th Century. In 1900, Russia was a huge empire covering 1/6 of the world’s land area. It had great climate variations – frozen tundra. Revolution & Nationalism Chapter 14 (pp ). War Communism and NEP. War Communism, what is it? War Communism can also be referred to as socialism. It was the name given to the economic system that. Rise of Communism. 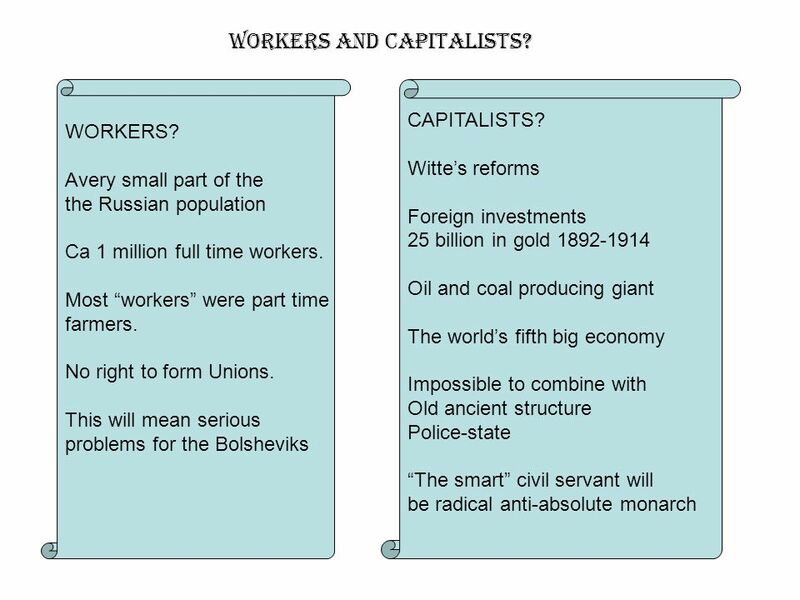 Causes of Revolutions and Socialist movements By the early 1900’s and into the 20 th Century, the ingredients for revolutions were. Russian Revolution. Roots of Revolution By 1914: Russia is the most backward European country. By 1914: Russia is the most backward European country. RUSSIA. THE MODERNIZATION OF RUSSIA A. Russia's rulers saw nationalism as a potential challenge to the Empire and realized that Russia's survival depended. 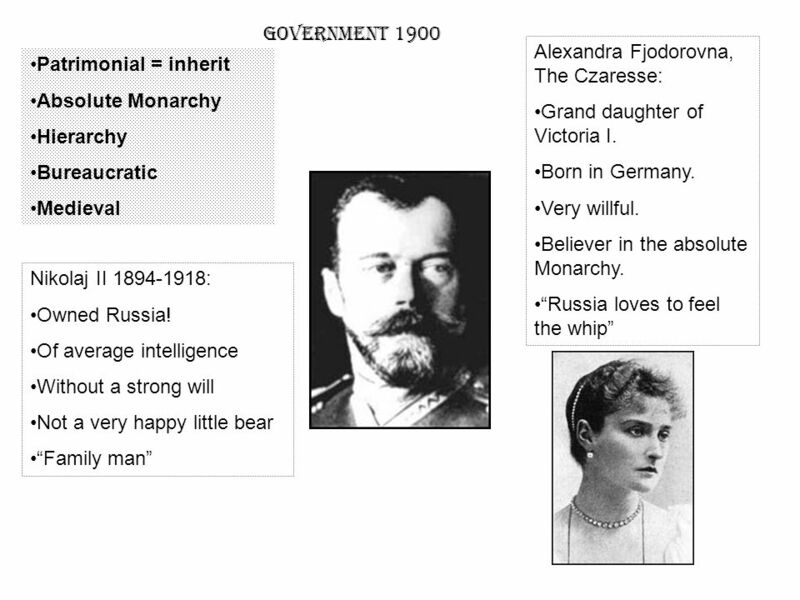 Tsar Life Imperial Russia. The Facts… Czar is the title given to the Russian leader For over 300 years, one royal family ruled, the Romanovs So what was. Russian Revolution Causes for March 1917 Revolution  Czars had reformed too little  Peasants extremely poor  Revolutionaries hatched radical. A New Era, the revolution continues Ch. 24 section 2. Revolution and Nationalism 1900-1939. 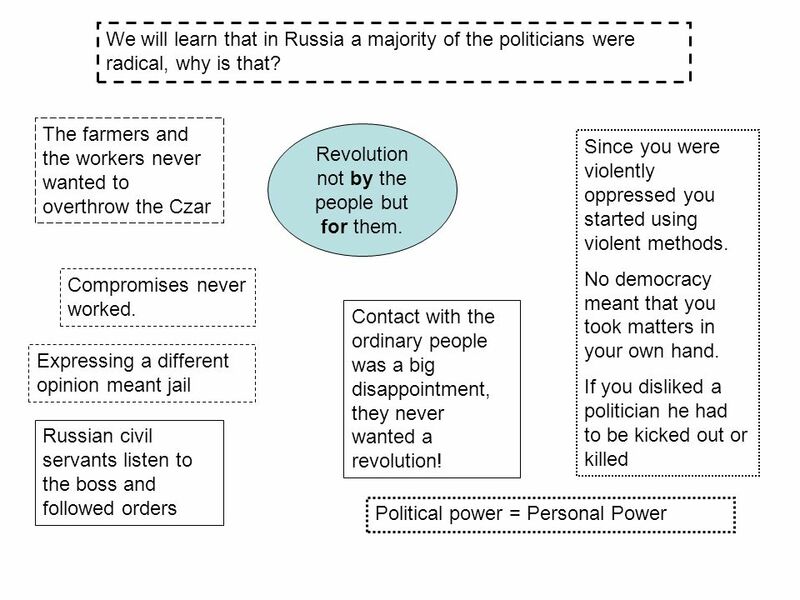 Revolutions in Russia C. 30 S.1 In 1881 revolutionaries frustrated by slow change in Russia, assassinated czar Alexander.